Fast acting ready to use weed and moss/algae killer, ideal for hard surfaces including patios, paths and driveways. 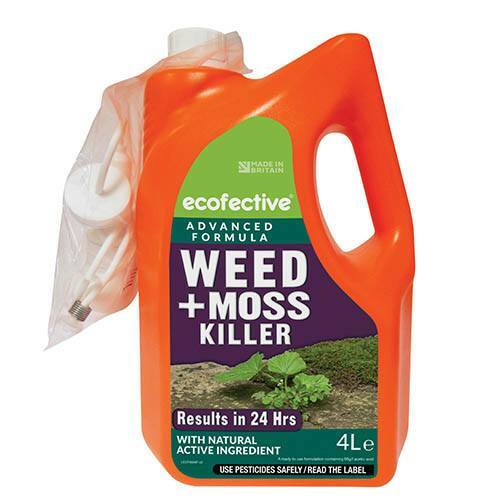 ecofective Weed and Moss Killer is an effective, dual action treatment which controls weeds and moss on hard surfaces such as paths and patios. The formula contains acetic acid and a patented co-formulation of natural ingredients to effectively burn unwanted weeds and moss. Simply spray on unwanted weed and moss to see visible results after just 24 hours*. ecofective Weed + Moss Killer dries quickly making the treated area safe to be used by children, pets and wildlife once dried. When weeds are in flower they are easily seen among your garden flowers. Resist the urge to spray with WeedBlast during the day when bees and other beneficial pollinators are actively visiting the flowers. Spray either early morning or late evening when the bees have left the area or when the weed is not in flower. Supplied ready mixed in a 4L container, provides up to 140sq metre coverage. Best results are achieved against moss and small weeds less than 10 cm high. There are no residual effects of ecofective Weed + Moss Killer in the soil. Spray directly onto the weed, with visible results after just 24 hours*. Apply on a dry, calm day when rain or strong winds are not expected. Apply at no more than 100ml/m2.